An Information Technology (IT) department is charged with the responsibility of developing and managing a company’s technology assets. The Information Technology (IT) department includes so many differentiations that it can be mind-boggling. Developing technology and apps for external and internal use. Managing the company’s email systems. Managing and building enterprise resource planning (ERP) platforms. Setting up and troubleshooting networks. Backing up data and securing the information. Ensuring the security of all IT assets. Management of all equipment for the transmission or reception of data. Management of all computing equipment. Management of all network equipment and systems. A company’s IT department handles all equipment used for acquisition or storage. The daily issues and efforts facing — and solved — by an IT team cannot be overemphasized. This team manages all various technology assets that will be impacting productivity, and they are charged with fixing those issues. There’s so much change happening across the world of technology. There is greater adoption of technologies that use artificial intelligence, machine learning which has been a game changer for IT departments. Blockchain has entered the IT picture, as well as new devices like IoT applications, chatbots, virtual reality, and augmented reality. Change breeds excitement among consumers and businesses alike, but there are challenges that companies face with this rapidly advancing technology environment. There is a push for digital transformation and expectations about security and experiences. These challenges include deciding what technology to invest in, integrate, or develop, especially with the speed at which technology is changing. There are also data backup problems and security risks. IT departments are also challenged by determining the best approach to scale new or existing technology platforms and tools as the business grows. One of the most significant issues, though, continues to be the lack of skilled talent that is necessary to develop and manage all the technology. The changing work dynamic has given rise to innovation and diversity which has created a borderless job pool. There are opportunities to work with talent all over the world on a remote basis. Now those trained in IT can work remotely from anywhere — and move to exciting locations, retaining the same IT position with the same company. With these ongoing changes and challenges, technology is introduced into every function and department in an organization. 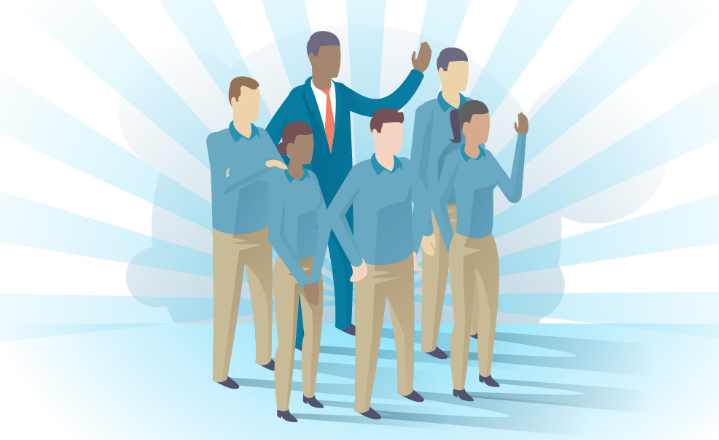 Plus, there are new IT roles, and the lines of responsibility have sometimes become blurred. Even with the blurred lines, there is a hierarchical status that can be identified within a typical IT department structure. 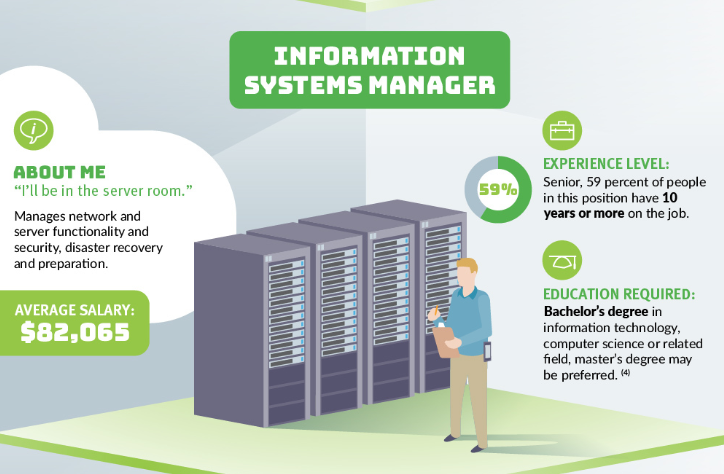 Jefferson University developed an infographic that illustrates how an IT department now looks. Take a look at what each layer and role does; note the education required and the average salary. 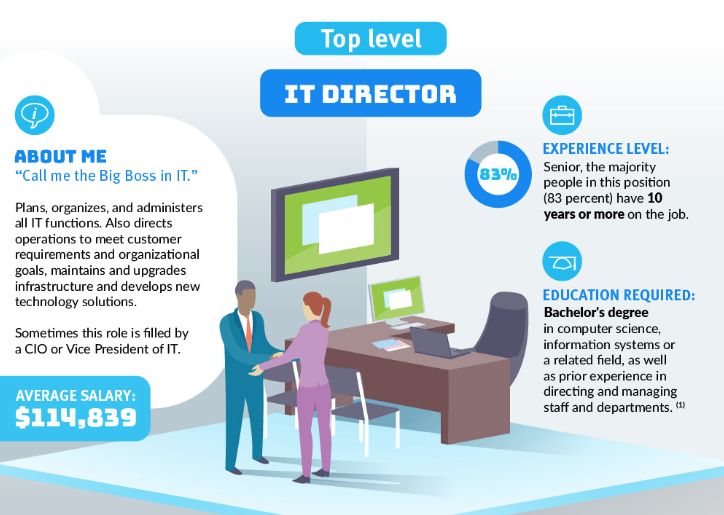 The IT Director is the top of the hierarchy and is also known as the Chief Information Officer (CIO) or Vice President, IT. In this leadership position, they are responsible for setting strategic direction in line with the company objective as well as overseeing all IT functions and managing the IT budget. This senior-level position typically is filled by someone with ten or more years of experience in IT. They have a bachelor’s degree in a technical area and can show a track record of management. Typically, the average salary is $114,839. The Information Security Manager’s key responsibilities include managing networks and infrastructure security throughout the organization — this consists of the ability to try and stop breaches of any kind; including security attacks. 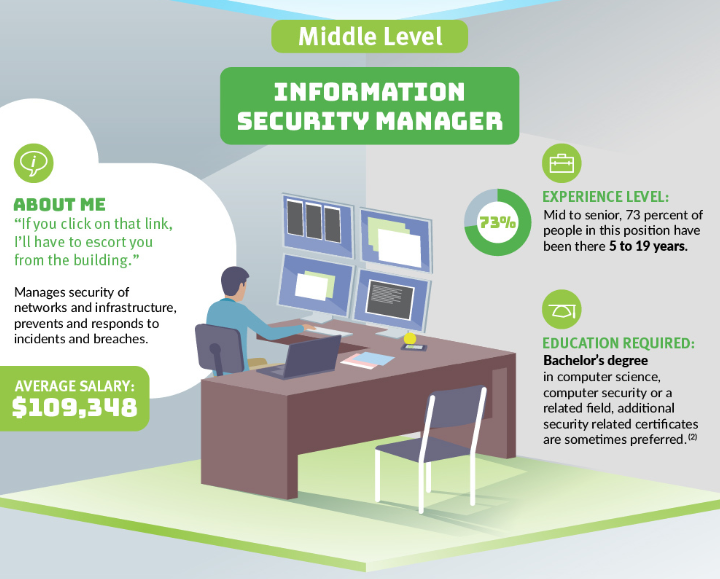 Those in this position typically have a degree in computer science or security and have experience between five and nineteen years. The average salary is $109,348. 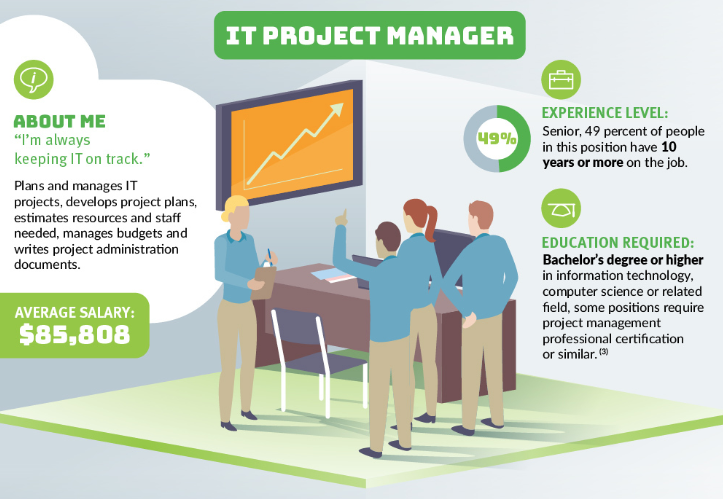 This position of IT Project Manager involves planning and managing all IT projects across the department and those that relate to other functions and departments. They oversee the budget and track resources to stay on target with the IT strategy. The role requires a bachelor’s degree or higher in IT or computer science as well as at least ten years of experience. The average salary is $85,808. In the role of Information Systems Manager — you’ll be focused on network and server operations. These IT professionals are in charge of any business continuity including detailed planning and understanding of disaster recovery. This manager ensures that all data and systems are backed up properly for minimal downtime and no data loss. Requirements include a bachelor’s degree — although a master’s degree is preferred — in IT or computer science. Ten or more years of experience is the average Systems Manager’s background. The average salary is $82,065. 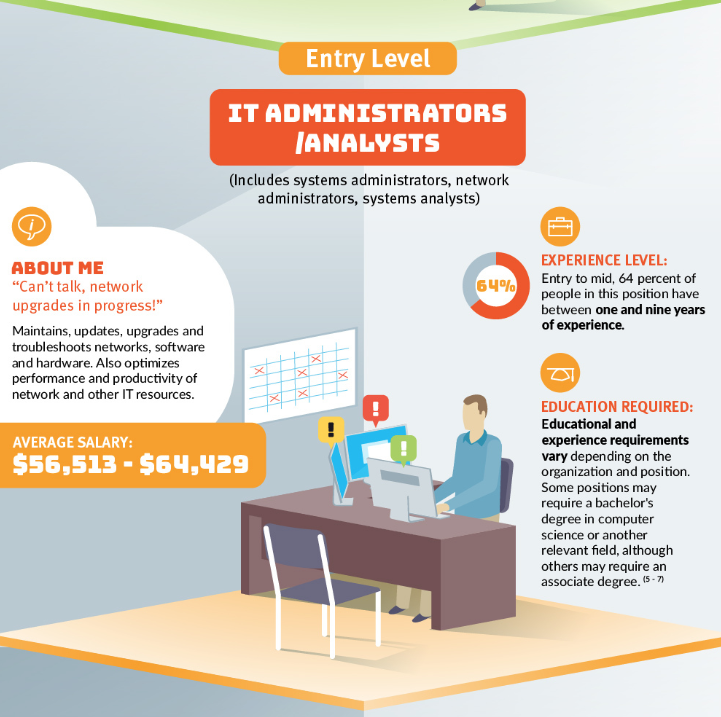 To move into these higher level positions means starting your IT career at the entry level. There are many options at an entry level. To begin with, you want to find a company who will provide the experience necessary to advance your career in IT. IT Administrators and Analysts professionals encompass a number of positions, including systems and network administrators as well as systems analysts. Both the Administrators and the Analysts put in a lot of effort to maintain, upgrade, and troubleshoot all IT assets. These executive can handle any complication with hardware, software, and networks. While some positions provide entry into a job with just an associate degree, other positions may require a bachelor’s degree in computer science or IT. Required experience is anywhere from one to nine years with an average salary of $60,000. IT Engineer Professional’s have the responsibility of the hardware, software, and systems engineers. The IT Engineer’s primary focus is on providing technical support as well as setting up hardware, software, networks, and systems that a company uses. This position also averages between one and nine years of experience. 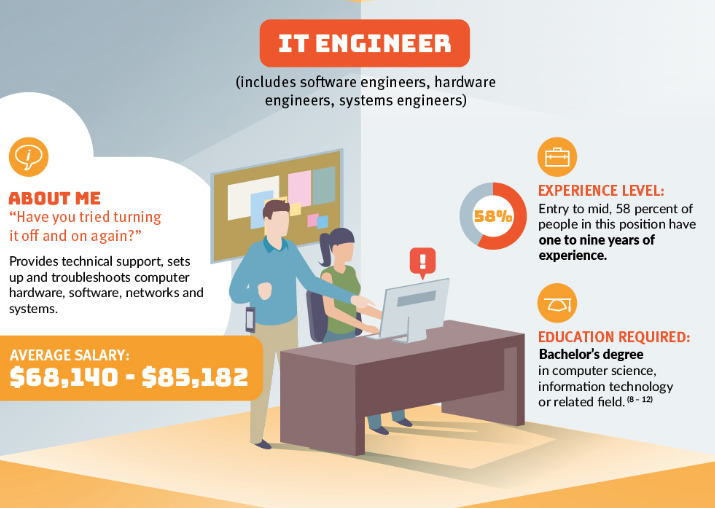 The IT Engineer usually requires a bachelor’s degree in IT or computer science. The average salary is between $68,000 and $85,000. There are variations in this department and depending on the type of IT engineer, number of years of experience, and the company, the Engineer may also have other operations they handle. Researching an IT Career and options. Even entrepreneurs in new startups are finding that some personal ability in the IT field helps distinguish the best candidates for the job in their company’s. With the ongoing need for skilled IT professionals — this is a career field that will continue to grow. The demand for better trained IT professionals continues. To help fill these gaps, more educational, training, and certificate programs are essential. Appearing alongside the urgency for more IT specialists and experts is an affordable and convenient online IT degree program. This set of options in the online program offerings can propel an individual into a lucrative career with diverse choices and opportunity. *All Infographics thanks to Jefferson online education.